Imagine you had to run to a 100m finish line in 20 seconds, for most of us this falls into the ‘challenging but doable’ category. But what if the rules of the game changed, so now each time you run that race the finish line moves further away? At first you can get more efficient, you can run faster, and still make the finish line in 20 seconds. But eventually the finish line is going to be so far away that even Usain Bolt at his top speed wouldn’t make it in time. Does the fact you can no longer reach the finish line in 20 seconds mean you are ‘bad’? But if you are running faster than you were the first time you raced and finishing a longer race, are you actually performing ‘better’? Or can both be true at the same time; can you be both ‘bad’ and ‘better’? To learn to accept that something can be both bad and better at the same time is one of the challenges put forward in the book Factfulness, which aims to help us take a more balanced approach to interpreting the world around us. This got me thinking about NHS performance data and whether it tells a story that is both bad and better. One of the key standards used to judge how well the NHS is performing is in A&E where 95 per cent of patients should be admitted, transferred or discharged within 4 hours of attending an A&E department. Performance is currently well below the standard. But is this bad and worse than when the standard was last met in July 2013, or can we make a case for it being bad and better? The bad bit is straightforward: in July 2018 average performance in major A&E units was 83.5 per cent, with many patients waiting longer for their care than they should. 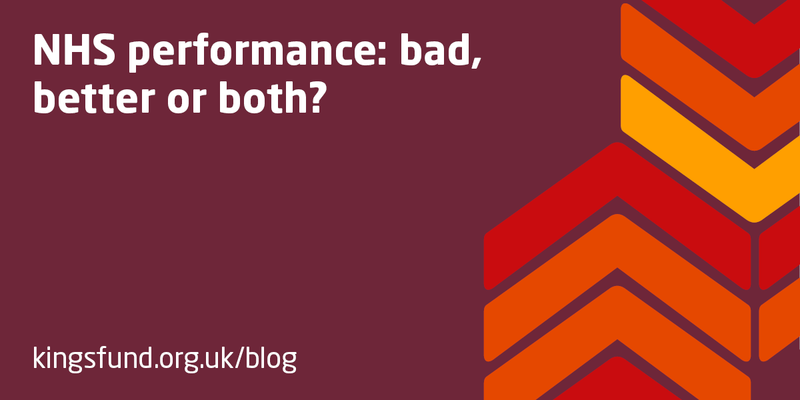 If we are to categorise A&E performance as bad and worse we need to work on the premise that performance has fallen to this level while everything else has stayed the same: the same number of people attending A&E with the same types of illnesses, the same proportion of patients admitted to hospital, and the same number of people and capacity to treat them as in July 2013. Or that demand and resources have changed at the same pace. The data shows that that is not the case. Compared to July 2013, there are 3,000 more people going to A&E every day. We also know that these patients are sicker, receive more complex care in A&E, and more are admitted to hospital than five years ago. The race in A&E has definitely got longer. The challenging part of the argument is working out whether the extra demand has been met by extra resources; particularly in a complex system like health and care where decisions in one part of the system can have unintended outcomes in another. Thinking simply about the number of people attending A&E, in July 2013 there were 145 trusts with major A&E departments, each seeing about 285 patients a day. To meet the demand of an extra 3,000 people per day we would need the equivalent of 10 more major A&E departments. Over the past five years we haven’t seen resources increase at anywhere close to that rate. That the NHS is missing one of its key standards is a bad thing. This is a standard of care that the NHS has committed to delivering. However, if A&E departments are treating more, sicker patients, but don’t have extra resources to match rising demand, I would argue we have a strong case for bad and better. So why is it important to be able to think of something as both bad and better? Crucially, it means we have a more balanced and complete interpretation of the world which helps us make better decisions. It also impacts on our motivation. Bad and better drive different types of motivation, one to change something that is not good enough, and the other to keep motivated by the improvement that we see. As a staff member in an under-resourced A&E department to be told month after month that no matter how fast you run it is never good enough must be demoralising. In a people business, like the NHS, that can have a significant impact on recruiting and retaining the staff it needs. Something which is already top of NHS leaders’ worry list. When standards in the NHS – be that for A&E, planned operations, ambulance performance or any of the others – were developed, desired outcomes and the available resources were taken into account to set standards that were both stretching and achievable. If, over time, we talk about those standards, without recalibrating our understanding of the context in which services are operating we are assuming that the world has stayed the same. I am not arguing that the standards the NHS aims for should change, but that we need to change the way we talk about them to recognise the current context; accepting that the rules of the game have changed and will change again in the future.